A 17-year-old male diagnosed with congenital adrenal hyperplasia (CAH) at the age of six months presented to the endocrine clinic with pain and swelling in both testes. When he was seven years old he developed signs of precocious puberty and was treated with triptorelin 3.75 mg (intramuscular) once a month between 2007 and 2011. He was asked to continue long-term treatment with hydrocortisone (three times daily) 10/5/5 mg and fludrocortisone 100 mg (once daily). However, he was not regular with his medication. Except for morbid obesity (body mass index = 51 kg/m2), his systemic examination was normal. Both testes were swollen and tender on palpation. Images of the ultrasound and Doppler of the left testes are shown [Figure 1 and 2]. 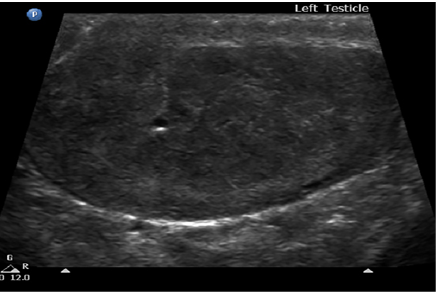 Figure 1: Ultrasound of the left testicle showing hyperechoic areas. 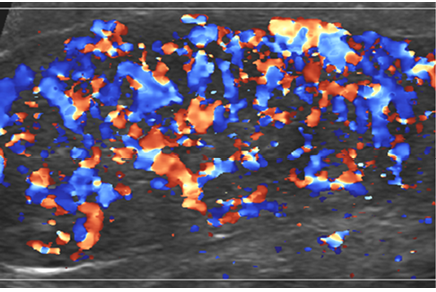 Figure 2: Doppler ultrasound of the left testicle showing increased vascularity. What do the features on the ultrasound and doppler suggest? His 17-OH Progesterone level was 282.5 nmol/L. What could be the cause? a. The ultrasound and doppler show hypoechoic areas with increased vascularity in both testes. This suggests the possibility of testicular adrenal rest tumors (TART) given that this patient is a known case of CAH. a. The elevated 17-OH Progesterone levels confirm that he has not been compliant with his medication. a. The first step would be to request him to take his medication regularly. We also have to address his obesity by advising him about diet and exercise. TART were first described in 1940. They occur as a complication of CAH.1–5 The reported prevalence of TARTs varies from 0–94%. These lesions are typically located within the rete testis; they are bilateral, synchronous, nodular, and are dependent on adrenocorticotropic hormone (ACTH). Histologically, TART resemble adrenocortical tissue. Differentiating TART from malignant Leydig cell tumors can be difficult. 4) they induce fibrosis and lymphatic infiltration of the testicular parenchyma; 5) they cause irreversible damage to the testicular parenchyma. Because these tumors lie within the rete testis, TART are difficult to palpate. Only tumors larger than 2 cm are detected clinically. Ultrasound and magnetic resonance imaging (MRI) are equally good for identifying these tumors. However, ultrasound is preferred because it is quick and can even detect very small tumors. Stage 2 tumors are seen as small hypoechoic lesions, while tumors beyond stage 3 have fibrous strands that are visible as hyperechoic reflections. TART lead to structural testicular damage, spermatogenesis disorders, and infertility. Because of underlying 21-hydroxylase (21-OH) deficiency, these patients have high circulating levels of serum ACTH, 17-OH progesterone, and androgens. Intensive corticosteroid treatment, which suppresses ACTH, often leads to a reduction in tumor size. For tumors that have reached stage 4 increasing the dose of glucocorticoids will not decrease tumor size, but the removal of the tumor tissue prevents further testicular damage. Because of their benign nature, testes sparing surgery is recommended. As tumor growth is related to hormonal control, it is important to closely monitor serum ACTH, renin, 17-OH progesterone, and androstenedione levels in these patients. TART are frequently seen in males with CAH, and can be mistaken for primary testicular cancer. Boys with CAH should undergo periodic ultrasound screening for the early detection of these tumors. Compliance with medication reduces the risk of testicular damage. Clinical outcome, hormonal status, gonadotrope axis, and testicular function in 219 Adult men born with Classic 21-Hydroxylase deficiency. [cited August 2015]. Available from: http://www.ncbi.nlm.nih.gov/pubmed/25822101. Ali HH, Samkari A, Arabi H. Testicular adrenal rest “tumor” or Leydig cell tumor? A report of a challenging case with literature review. Avicenna J Med 2013 Jan;3(1):15-19. Delfino M, Elia J, Imbrogno N, Argese N, Mazzilli R, Toscano V, et al. Testicular adrenal rest tumors in patients with congenital adrenal hyperplasia: prevalence and sonographic, hormonal, and seminal characteristics. J Ultrasound Med 2012 Mar;31(3):383-388. Claahsen-van der Grinten HL, Sweep FC, Blickman JG, Hermus AR, Otten BJ. Prevalence of testicular adrenal rest tumours in male children with congenital adrenal hyperplasia due to 21-hydroxylase deficiency. Eur J Endocrinol 2007 Sep;157(3):339-344. Grinten HC der, Hermus ARMM, Otten BJ. Testicular adrenal rest tumours in congenital adrenal hyperplasia. Int J Pediatr Endocrinol [Internet]. 2009 Jan 26 [cited August 2015]; 2009:624823. Available from http://ijpeonline.biomedcentral.com/articles/10.1155/2009/624823.